This is done by continuous scanning of the crop canopy (every 2 hours) with 3D imaging of the leaf area, that consists of projection of a laser line (940nm wavelength) which is fully reflected by the crop canopy and imaged at a high rate (50-80 pics s-1) by a camera with a 940nm filter. 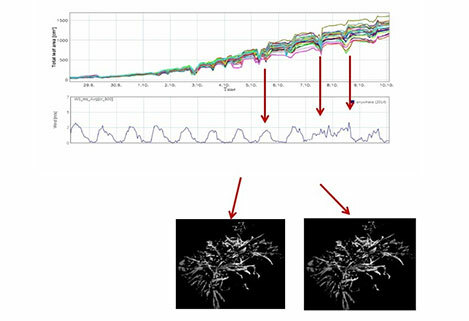 A 3D image is then reconstructed from the many 2D pictures and a3D laser triangulation of the crop canopy allows to extract a number of plant parameters, including the 3D leaf area, projected leaf area, plant height (See Vadez et al., 2015 doi:10.1093/jxb/erv251for a full description). 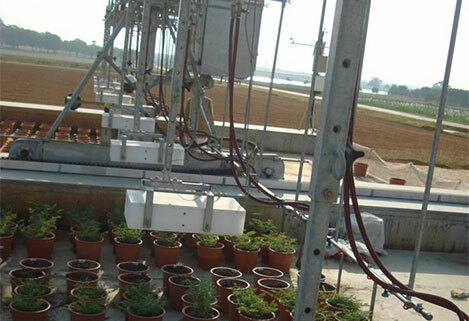 The platform uses a sensor-to-plant concept, contrary to most existing systems where the plants are conveyed to an imaging cabinet. Therefore, scanners are supported by an irrigation boom and are then moved above the plants (that are then undisturbed). The scanners use barcode references to set their x and y position in the platform. A typical experimental plot (called a sector) consists of a width of 65cm and a length of either 40 or 60 cm, giving a surface of either 0.26 m2 or 0.39m2. We have chosen to set up the platform in outdoors where environmental conditions are constantly monitored and data integrated every 30 min (relative humidity, temperature, solar radiation, wind and rain). In addition, plants are cultivated at densities reflecting the field conditions, so that a 0.26 m2 sector contains 8 chickpea plants or 4 pearl millet plants to reflect sowing densities of 30 or 15 plant m2 respectively. Plants are cultivated either in large pots (27 or 34 cm diameter containing 10 or 15 kg of soil – 2 pots/sector) or large trays (40x60x30cm widthxlengthxdepth and are filled with about 75 kg of Vertisol). We are still at the beginning of the exploitation of these rich datasets. Simple analysis can be done of the different parameters measured at different time points using simple REmL analysis (all experiments follow an Alpha design). Analysis of rate of increase in parameters can be done. The first step is to convert the date measurements into thermal units, which allows to compare experiments across time. Then slope of increase of the different parameters can be measured for any chosen interval.